1738 ~ 1756: born in Ôsaka. His first stage name is Nakayama Gennosuke and his master is Nakayama Shinkurô I, the adoptive father of his brother Nakayama Bunshichi I. Later on, he takes the name of Matsuya Raisuke II after the death of his father. 11th lunar month of 1756: Raisuke becomes tachiyaku and performs at the Ônishi no Shibai in the kaomise drama "Ômatsu Kyokusuke Tanzen Roppô". 11th lunar month of 1757: Matsuya Raisuke II takes the name of Nakayama Raisuke I, playing at the Naka no Shibai the role of Yatarô in the kaomise drama "Sakiwake Musha Kôbai no Tazuna", which is produced by Anegawa Shinshirô II. 5th lunar month of 1762: premiere in Ôsaka at the Kado no Shibai of Namiki Shôzô I's drama "Koi Hakke Hashira Goyomi", which is a revision of Chikamatsu Monzaemon's drama "Daikyôji Mukashi Goyomi"; Raisuke plays the role of Obiya Niemon [more details]. 3rd lunar month of 1763: Raisuke's rank in the Ôsaka hyôbanki, tachiyaku section, is jô-jô-(shiro)hankichi (superior - superior - (white) half excellent). 7th lunar month of 1763: Raisuke plays at the Kado no Shibai the role of Umeômaru in the drama "Sugawara Denju Tenarai Kagami"; his stage partners are Nakayama Bunshichi I (Matsuômaru, Terukuni), Nakayama Shinkurô I (Kakuju, Shihei), Arashi Hinasuke I (Haru), Anegawa Daikichi I (Tonami, Yae), Asao Tamejûrô I (Hyôei, Shundô Genba), Bandô Toyosaburô I (Shiratayû), Fujikawa Hachizô I (Genzô, Sukune Tarô), Ichinokawa Hikoshirô II (Sakuramaru), Yoshizawa Sakinosuke II (Chiyo, Tatsuta) and Nakamura Kichiemon I (Kan Shôjô). 9th lunar month of 1764: première in Ôsaka at the Kado no Shibai of "Oriawase Tsuzure no Nishiki", based on the puppet drama "Katakiuchi Tsuzure no Nishiki", which is produced by Nakayama Bunshichi I and celebrates the 16th anniversary (17th memorial service) of the passing away of the star Anegawa Shinshirô I. A similar play is staged one day later under a different title, "Hare Kosode Tsuzure no Nishiki", at the Naka no Shibai [casting]. The competition for the best performance and the best line-up is open between the 2 theaters. The performance at the Kado no Shibai is more successful than the one at the Naka no Shibai; Raisuke plays at the Kado no Shibai the roles of Shundô Suketarô and Mareya Ihachi [casting]. 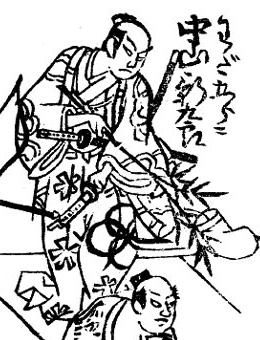 1st lunar month of 1766: Raisuke's rank in the Ôsaka hyôbanki, tachiyaku section, is jô-jô-(shiro)kichi (superior - superior - (white) excellent). He shares this rank with Arashi Kichisaburô I. 12th lunar month of 1766: Raisuke plays at the Kado no Shibai the role of Shigetada in the drama "Hirakana Seisuiki", which is produced by Arashi Hinasuke I; his stage partners are Fujikawa Hachizô I (Matsuemon, Higuchi no Jirô Kanemitsu), Arashi Hinasuke I (Umegae), Ichinokawa Hikoshirô II (Kajiwara Genta Kagesue), Nakayama Shinkurô I (Gonshirô), Arashi Koroku I (Enju), Yoshizawa Ayame III (Oyoshi, Tomoe Gozen) and Arashi Shichigorô II (Kajiwara Heiji Kagetaka). 7th lunar month of 1767: Raisuke plays the role of Issun Tokubê in the drama "Natsu Matsuri Naniwa Kagami", which is staged at the Kado no Shibai to commemorate the 6th anniversary (7th memorial service) of the passing away of Fujikawa Heikurô [casting]; the roles of Danshichi Kurobê and Tsuribune Sabu are played by Fujikawa Hachizô I and Ichinokawa Hikoshirô II. 12th lunar month of 1767: Raisuke plays the roles of Tomomori and Hôgen in the drama "Yoshitsune Senbon Zakura", which is staged for the first time at the Kado no Shibai [casting]. 6th lunar month of 1770: Namiki Shôzô I's drama "Yadonashi Danshichi Shigure no Karakasa" is staged for the first time in Ôsaka ôshibai, at the Kado no Shibai; Raisuke plays the role of Daimonjiya Jihei (commonly called Sakai no Daiji) [casting]. 3rd ~ 5th lunar months of 1771: first Kabuki adaptation of the puppet theater drama "Imoseyama Onna Teikin", produced by Mimasu Tokujirô I at the Kitagawa no Shibai; Raisuke plays the roles of Daihanji no Kiyosumi and Soga no Iruka [casting]. 9th lunar month of 1773: Raisuke plays in Kyôto the role of Shôgen in the drama "Keisei Hangonkô", which is produced by the zamoto Ogawa Kichitarô I for the nadai Ôsaka Tazaemon at the Kado no Shibai; his stage partners are Arashi Hinasuke I (Otoku) and Mimasu Daigorô I (Matahei). 3rd day of the 4th lunar month of 1775: his master Nakayama Shinkurô I dies. 12th lunar month of 1776: premiere at the Naka no Shibai of Nagawa Kamesuke I's drama "Igagoe Norikake Gappa"; Raisuke plays the roles of Honda Dainaiki, Sasaki Tan'emon, Arao Shuzen and Matsuno Kinsuke [casting]. 4th lunar month of 1777: premiere in Ôsaka at the Naka no Shibai of Nagawa Kamesuke I's drama "Meiboku Sendai Hagi"; Raisuke plays the roles of Masaoka and Date Jirô [casting]. 1st lunar month of 1778: premiere of Namiki Gohê's drama "Keisei Hakata Ori", which is produced at the Minamigawa no Shibai by Mimasu Jirôkichi; Raisuke plays the role of Mukai Rinzaemon [casting | picture and details]. 12th lunar month of 1781: premiere in Ôsaka at the Kado no Shibai of Nagawa Kamesuke I's drama "Tengajaya-mura"; Raisuke plays the role of Ningyôya Kôemon [casting]. A similar play is staged a few days later under a different title, "Renga Chaya Homare no Bundai", at the Naka no Shibai [casting]. The competition for the best performance and the best line-up is open between the 2 theaters. 9th lunar month of 1782: Nakayama Raisuke I takes the name of Nakayama Shinkurô II at the Kado no Shibai, playing the roles of Banzaemon and Yomosaku in the dramas "Monogusa Tarô" and "Saiwai Ariwara Keizu", which are produced to celebrate the isse ichidai peformance of his brother Nakayama Bunshichi I. 11th lunar month of 1782: Shinkurô plays at the Kado no Shibai the role of Wada Gorô (in reality Wada Shinzaemon) in the kaomise drama "Yamato Moji Sansai Zue". 3rd lunar month of 1783: Shinkurô appears on stage for the last time, at the Kado no Shibai where he plays the roles of Kôsaka Jinnai and Fukushimaya Ibei in the dramas "Keisei Kogane no Shachihoko" and "Shinjû Natane no Kumotsu". He suddenly falls ill and quickly dies. Nakayama Shinkurô II was an Ôsaka tachiyaku actor, who made a great career in Kamigata from the 1760s to the beginning of the 1780s. He excelled in budôgoto and jitsugoto. He unfortunately died too early, at the beginning of his forties, with his final ranking in the Ôsaka hyôbanki being only one little stroke below jô-jô-kichi.